“Full Employment” is (supposedly) all around us! Posted on August 4, 2016 by Marcus Nunes under Full Employment. Indeed, Alex Tabarrok, an economist at George Mason University, argues that it’s “crazy” to believe that a lack of demand explains the slow recovery. “The time period in which monetary policy would have been effective is long over,” he says. Once an economy reaches full employment, he argues, there’s no way for increased spending to boost economic output — you’d just get more inflation instead. And the US unemployment rate is currently 4.9 percent, near historic lows, a sign that a shortage of demand might not be a problem right now. Unfortunately, “full employment” is a very imprecise and elusive concept. More than 50 years ago, Arthur Okun came up with the tongue-twisting concept of “full employment rate of unemployment” (Also called NIRU, or “Noninflationary Rate of Unemployment”, which then became NAIRU – Non Accelerating Inflation Rate of Unemployment). At the time he pinned it at 4% (but imagined it could be lower). The pursuit of that idea ended up throwing the economy into the “Great Inflation”! Over time the “concept-number” has varied a lot, mostly being pinned between 5% and 7%. It´s a Phillips-Curve based concept, relating unemployment to inflation. In other to have a better handle of the meaning of “full employment” at present, I compare two episodes during which the prevalent view was one that the economy was at “full employment”. The present (2012 – 2016) and during 1993 – 1997. To do that I put up a set of charts contrasting the two “full employment” periods. 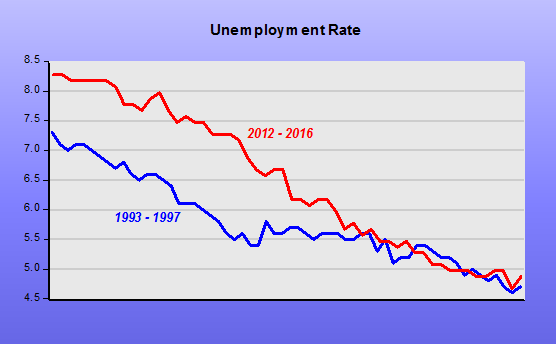 The first chart shows that both then and now, the rate of unemployment was falling and, as then, the unemployment rate has fallen below 5%. Observe that in the earlier period, falling unemployment went along with inflation declining, while at present inflation has remained low throughout. According to the Okun concept, therefore, we have not yet reached “full employment”. Going deeper, the rate of unemployment is determined by two factors, the share of the population which is employed, the Employment Population Ratio (EPOP), and the “desire” of people to participate in the labor force, the Labor Force Participation Rate (LFPR). The unemployment rate, u, is then calculated as 1-(EPOP/LFPR). Therefore, the higher the EPOP, all else equal, the lower the unemployment rate, u, and the higher the LFPR, all else equal, the higher the rate of unemployment will be. The charts show the behavior of those two factors during the two periods. Their behavior is very different. While in the earlier period, EPOP was higher and generally rising, more recently it is much lower and relatively flat. When you look at the LFPR, in the earlier period it was higher and also generally rising, more recently it is much lower and clearly falling. 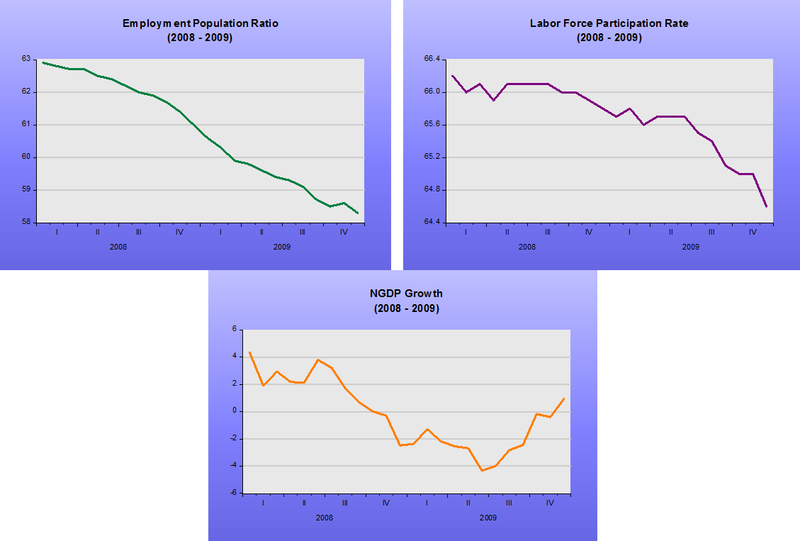 Both the EPOP and LFPR are determined, on the one hand by what we may call the “attractiveness” of the labor market. If jobs are plentiful and varied, if barriers to employment (things like occupational licensing) are low, the EPOP will be high, and so will the LFPR. Stable and robust aggregate demand (NGDP) growth is certainly a determining factor. As we saw, if the LFPR rate falls, given EPOP, the rate of unemployment will fall. Note that in 1993-1997, the rise in LFPR was more than compensated by the increase in EPOP, making for a declining rate of unemployment. At present, the picture is very different, with a declining LFPR facing a relatively flat EPOP. Although the result is the same, a falling u, we may not necessarily be content with the outcome. If the outcome at present is the result of a lack of job opportunities (low “attractiveness” of the labor market), we should not be happy and call the situation one of “full employment”. However, there may also be structural reasons for the fall in the LFPR. Those reasons would be the result of long-run trends, such as baby boomers beginning to retire. In short, those that say the economy is at present at “full employment”, implicitly are saying that the structural factors dominate the fall in the LFPR. But, is that a reasonable assumption? I don´t believe it is so. Structural factors don´t “summersault”, shock-like, they accrue, slowly. The charts below, however, show that EPOP and the LFPR changed shock-like, coinciding with the steep plunge in NGDP growth. 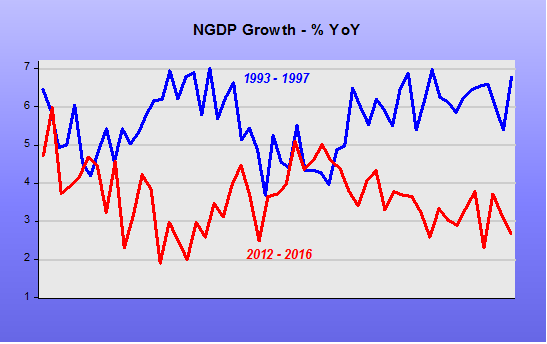 The next chart indicates that the robustness of aggregate demand (NGDP growth) helps explain the state of the labor market: “Attractive” in the earlier period and “Unattractive” at present. In that case, the lion´s share of the drop in the LFPR would be due to cyclical reasons. If that´s true, the present state is not one of “full employment” because the number of “missing workers” (workers who would be in the labor market if “attractiveness” were high) would be substantial, so “full employment” would not be an acceptable characterization of the present economic environment. Paraphrasing the populist candidate: “Make this Recovery Robust”! This entry was tagged Alex Tabarrok, EPOP, LFPR, Mark Zandi, NGDP Growth, Unemployment Rate. Bookmark the permalink. It’s the youth that is not participating. No clue as to what the reasons are. Labor Market very unattractive, especially for new entrants. Worse, macroeconomists seem to have forgotten (willfully?) the purpose of economic study: Prosperity! If the US can obtain low unemployment, even chronic “labor shortages” with low inflation, that would be a wonderful outcome. BTW, Japan is not far from that outcome now; the have the tightest labor markets in 24 years and simultaneous deflation. I guess they do not know about the Phillips Curve in Japan. I am totally for free markets and robust economic growth, I dislike regulations. Yet the American right-wing today seems to have declared war on the employee class. Low unemployment rates are seen as a threat, not a goal. 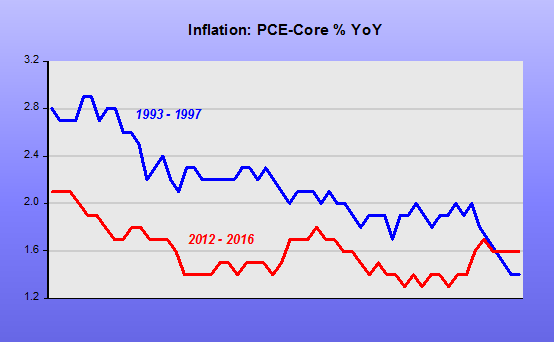 Would a few years of wage inflation above the CPI kill the country? We have not even reached that point yet. This is the hawkish politically correct way of saying enough or too many people have jobs. It’s interesting that many of them also complain about folks trapped in government dependency, and when these ideas are taken together, it seems like a bit of moral problem considering that we’re not, for the most part, an agrarian society. To add to my previous comment, I’d say that when basic government assistance programs become irrelevant, that’s when we’re at full employment.